A well-developed identity system defines an organization, describes its culture, differentiates and positions the organization within the context of the competitive marketplace, and ensures that messages sent to and received by appropriate targeted audiences are clear and consistent. 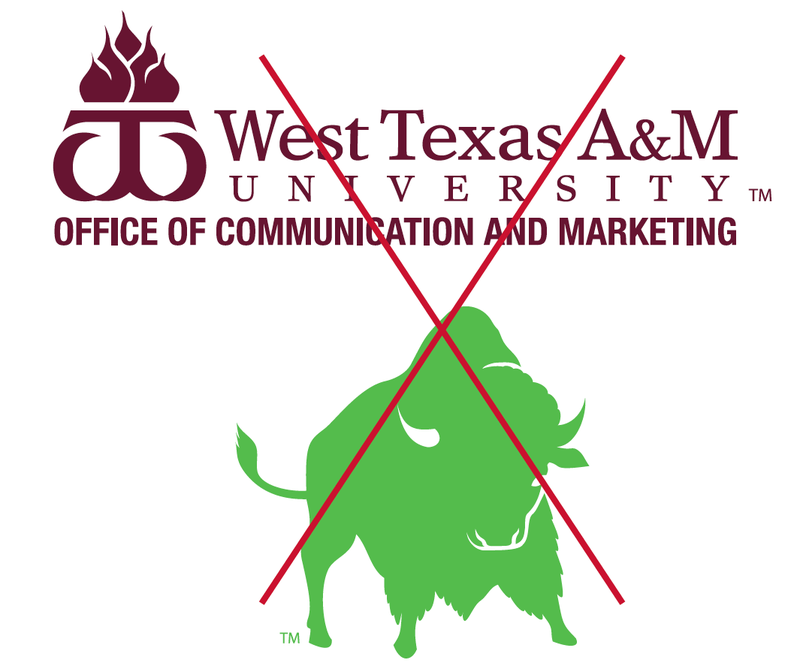 West Texas A&M University's graphic standards ensure a consistent and reliable brand image on all communications related to WTAMU. Fill out the creative request form to request creative services from the Office of Communication and Marketing. All requests will be completed based on University priorities, date of event or scope of project. 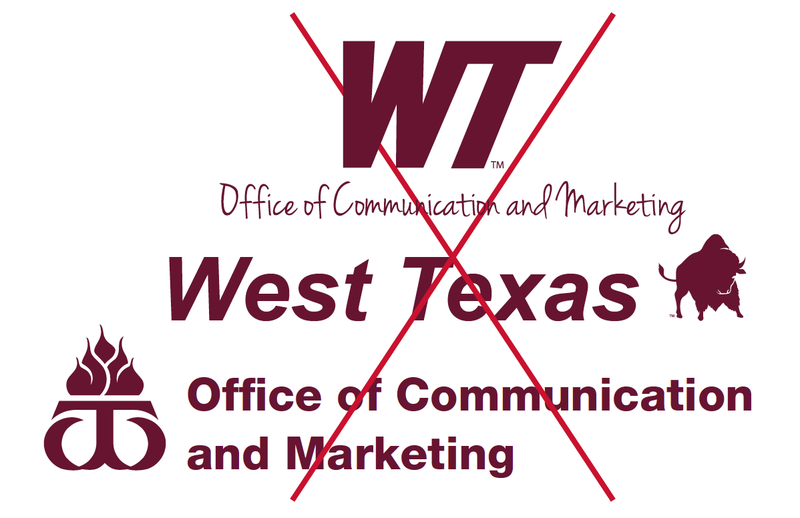 University and University-supported entities may not create/display logos and/or tag lines that compete with or replace WTAMU approved symbols. These standards apply to all visual representations of WTAMU, including print communications, electronic communications, websites and specialty items. These visual identifiers must be WTAMU maroon, white, black or gray and must be placed over a background so that they are distinguishable and maintain the integrity of the logo. The choice of visual identifier(s) will be determined by purpose, audience and space availability. Visual identifiers must be displayed prominently and must be presented according to the guidelines outlined in this document and may not be distorted, altered, combined with any other design to create a new logo, replaced by other artwork, defaced or vandalized in any way. 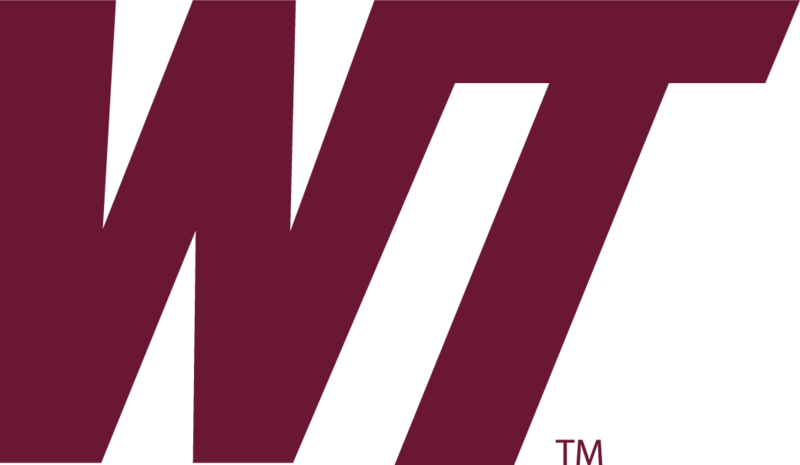 Three variations of the West Texas A&M University logo—(1) horizontal logo, (2) stacked logo and (3) vertical logo—in order of preference, have been designed and adopted for use on all visual representations of WTAMU, including print communications, advertising, electronic communications, website and specialty items. The choice of logo will be determined by purpose, audience and space availability. Symbols are supplementary trademarked identifiers for West Texas A&M University. Symbols should never be used in combination with any other image or type to create another logo. Symbols may be primarily used to stand alone on specialty items when space is limited but must never replace the full university logo on official communications. Logos have been developed for all University entities. These logos may be used in place of the University logo on unit-specific materials, such as a college brochure; however, the same usage rules apply (see page 16). Because each logo is different and requires special attention to spacing and other graphic details, contact the Office of Communication and Marketing at 806-651-2125 before using and to receive your approved unit logo. 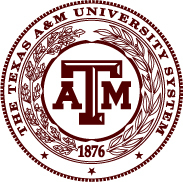 The West Texas A&M University seal is the most sacred of all University logos. Its use is restricted to formal applications, such as official documents, diplomas, certificates, flags and ceremonial materials. Reserved for presidential use, the seal should never give the impression it is the seal of any division, department or entity within the University. 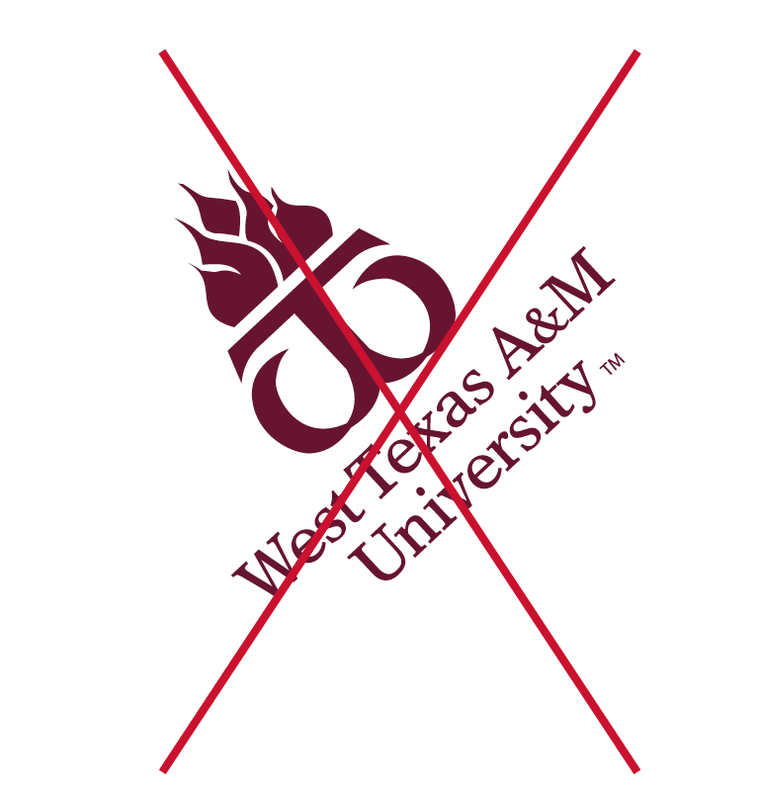 The WTAMU seal may not be used without express permission from the President’s Office. The University logo must appear prominently on the primary surface (most often the front cover) of all University publications. On publications with more than one printed surface, a logo, wordmark or symbol should also appear on the secondary outside surface. 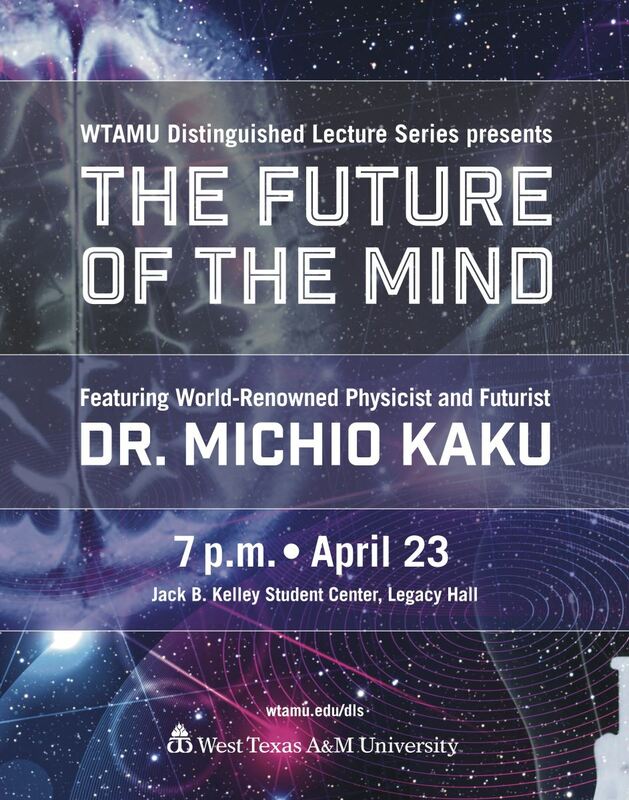 For more information, please contact Ann Underwood at (806) 651-2125 or aunderwood@wtamu.edu or Catherine McGovern at (806) 651-2122 or cmcgovern@wtamu.edu. Minimum size applications for University logos are 4-inch width for the horizontal logo, 2-inch width for the stacked logo and 1-inch height for the vertical logo. If used by itself, the flame symbol should be at least 1/2 inch in height. Specialty items are allowed exceptions due to space limitations. Do not crowd University logos. All symbols should retain a protected area that remains free of distracting type or imagery. 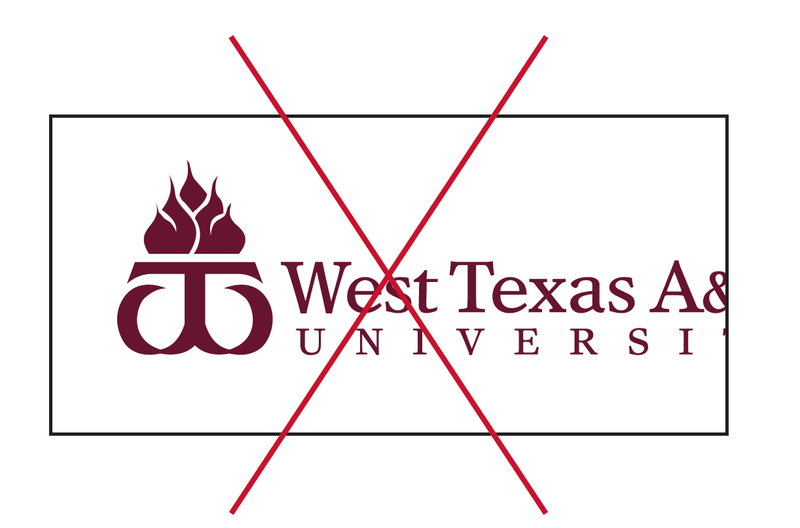 An area at least the width of the “x” in “Texas” should be maintained around the WTAMU logos. The following examples exhibit prohibited uses of University logos and symbols. For art approval and questions about the use of University identifiers, contact the Office of Communication and Marketing 651-2125. 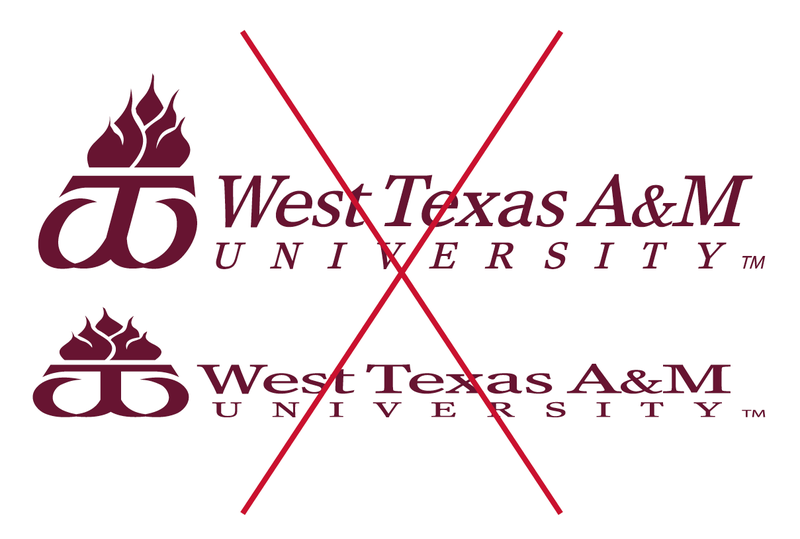 DO NOT distort, stretch or in other ways change the proportion of any of the WTAMU logos or symbols. DO NOT change type or add other type or images to modify or create a new logo. Department and student organization logos may be requested from the Office of Communication and Marketing and must adhere to style guidelines. DO NOT add styles or effects to University logos or symbols. DO NOT use old University logos in tandem with or as a replacement for current University identifiers. DO NOT crop or in any other way deface the logo. DO NOT change of the color of the logo or use more than one color. Approved colors for the WTAMU logos and symbols are maroon, black and white. Maroon takes preference over other colors. DO NOT place the logo over a busy photograph, background or non contrasting color. 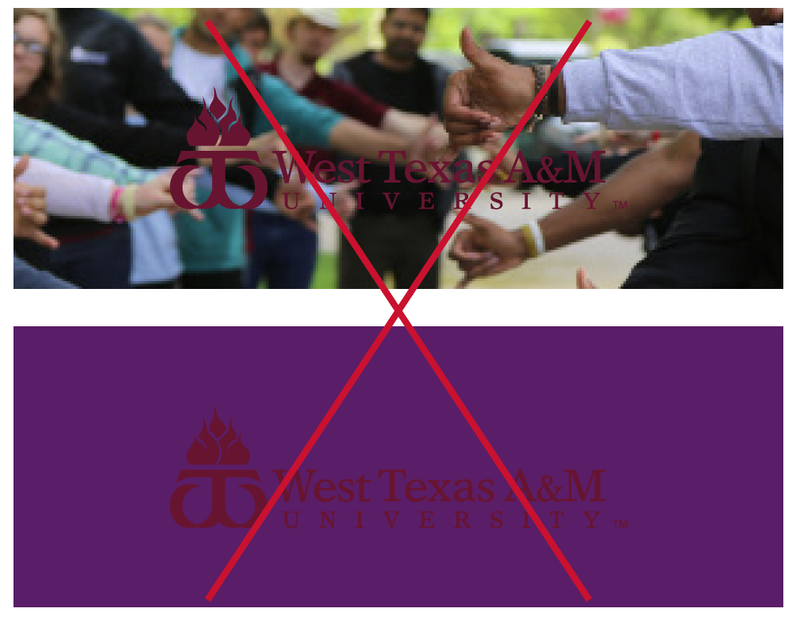 The primary colors on all University materials (print, web and promotional) should be maroon and white, the official school colors. In printer’s language, the official WTAMU maroon is Pantone Matching System (PMS) 7421 for coated (C) stock or PMS 7421 for uncoated (U) stock. For applications without PMS capability, use CMYK values C: 38, M: 94, Y: 63, K: 45 for coated and C: 43, M: 73, Y: 50, K: 22 for uncoated. Digital and inkjet printers such as Xerox and desktop printers should attempt to match 7421C as close as possible regardless of stock. Color swatches are shown here as examples only. Only professional printers can match PMS colors accurately. For digital use including TV, campus monitors, web usage and other digital media, the WTAMU maroon is represented by hex code #581818. For applications without hex capability, use RGB values 88, 24, 24. For questions about web colors, contact the web communication manager 651-3325. NOTE: This color is currently in transition from former web color #660000. The primary colors on all University materials should be maroon and white, the official school colors. Accent of black and gray are given preference over other colors which may be used as “attention grabbers” in limited quantities. 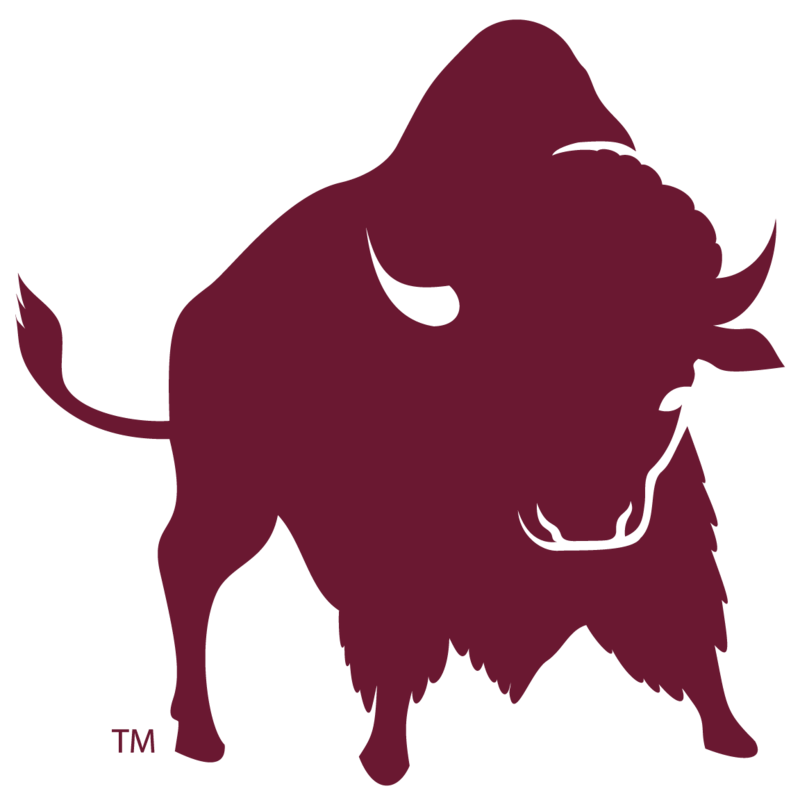 The University’s website home page illustrates the proper use of maroon, white and accent colors in WTAMU's color palette. For questions about approved colors and their use, contact the Office Communication and Marketing 651-2125. Some suppliers for items such as T-shirts, specialty items and paint may not reference PMS colors. Regardless, colors should match PMS 7421 as closely as possible. The approved thread colors are: Madeira 1385 and RA 2268. 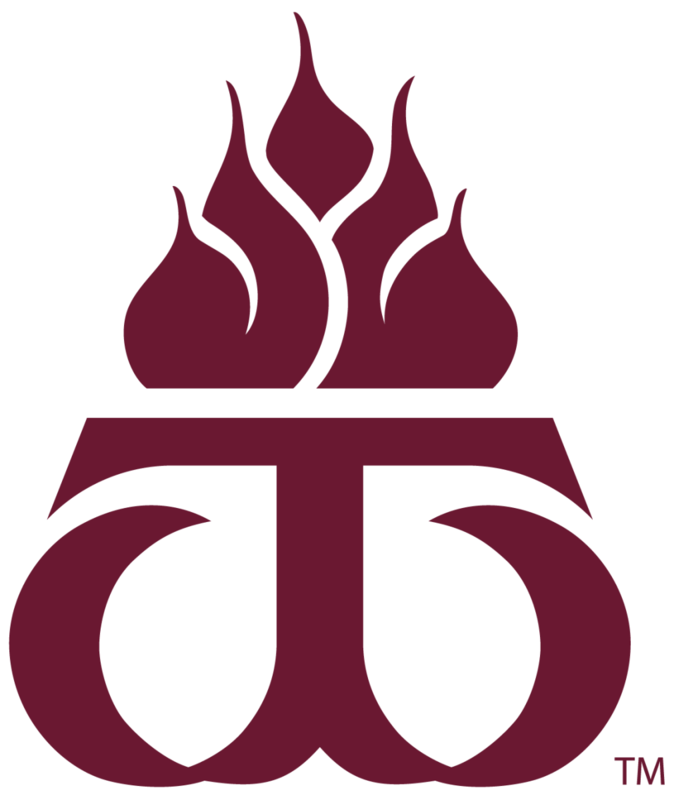 Whenever possible, the University’s logos and symbols should appear in maroon or reversed out of maroon. Logos and symbols may also appear in black or reversed out of black. No symbols or logos, including departmental logos, may appear in any colors other than maroon, white or black. These pieces of design examples illustrate the proper use of maroon, white and accent colors in WTAMU's color palette. Preferred fonts for WTAMU materials are the font families Helvetica Neue and Times Europa LT Std. If these fonts are not available, acceptable alternatives are Arial and Times New Roman. Regardless of font availability, body text should always be neat, readable and never typed in a "fashion font." Font families shown here are a selection only. Helvetica Neue contains over 45 different weights and styles that are acceptable for University publications. The University’s visual identifiers are registered through the state of Texas and licensed with Learfield Licensing Partners. This trademark licensing creates cooperative working relationships between the University, the manufacturers of approved and authorized products and the retail community. It assures that all merchandise bearing a WTAMU name or visual identifier promotes and protects the image of the University while fulfilling the needs of consumers. NOTE: Many retail outlets are not themselves licensed (and, therefore, will not appear on the approved vendors list) but do place orders with approved licensed manufacturers. The West Texas A&M University Bookstore is one such example. The University’s trademark licensing program is directed by Ann Underwood, director of communication and marketing. To become a Learfield licensed vendor call 806-651-2125 or email aunderwood@wtamu.edu. DO NOT use any University logos or symbols without the trademark (TM) marker. The Office of Communication and Marketing offers marketing assistance to any University department or college free of charge. The Office of Student Affairs offers marketing assistance to professional offices within the Division of Student Affairs. 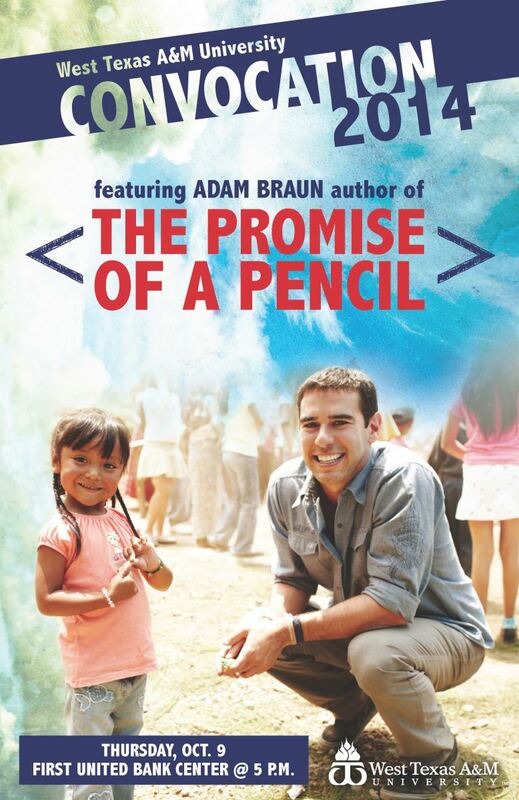 Requests should be made four to six weeks before marketing materials are needed. Projects time may differ depending on the complexity and volume of materials needed. Materials may include printed items, web promotion, event photography and more. To receive marketing assistance fill out the appropriate creative request form. The University awards exclusive printing rights to companies based on competitive prices, quality and ability to meet the University’s needs. All printed materials from campus entities must be ordered through the University Print Shop. The Print Shop will produce or bid your job out to an approved contracted printer depending on quantity and complexity of the job. 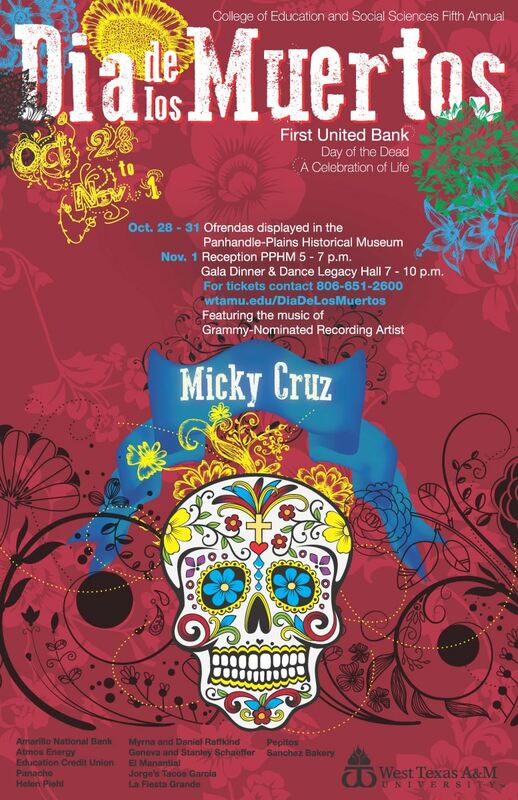 For more information on printing, contact the Print Shop at 651-2320 or printshop@wtamu.edu. 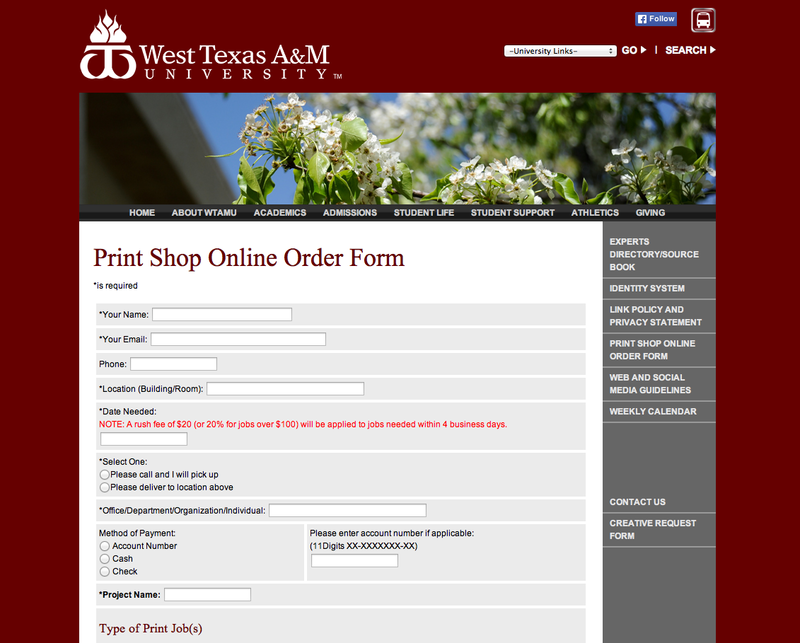 Print requests may be submitted at wtamu.edu/printshop. There's no reason to spend much time on official WTAMU letterhead, envelopes and business cards. These items are based on strict guidelines and must be ordered through the University Print Shop using the form at wtamu.edu/printshop. Please provide Print Shop personnel with your name, title, office/department, University mailing address, phone and fax numbers and email address, and they'll take care of the rest. Download a printable PDF version of Graphic Standards. Fill out the creative request form to request creative services from the Office of Communication and Marketing. All requests will be completed based on University priorities, date of event or scope of project.